Answer this trivia question. What does Barack Obama, Katy Perry, Kim Kardashian and Britney Spears all have in common? They are all now part of the Twitter 10 million follower club. They now share this distinction with Justin Bieber and the Queen of all Twitterdome Lady Gaga. Shakira, Taylor Swift, Rihanna, and Ashton Kutcher round out the top 10 almost 10 million member club. You may recall that Ashton Kutcher celebrated becoming the first person to reach 1 million followers back in April of 2009. So here is the million dollar question. 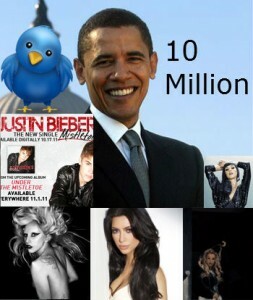 Is Twitter still relevant to those that follow Barack, Britney, Katy and Kim? Will we see Twitter’s influence begin to fade due to the popularity newer social networking services like Google+? Are those that follow the likes of Barack, Britney, Katy and Kim still being influenced by their Tweets. Even though Lady Gaga is currently number one on the list with 14,617,800 at this time of this blog post her Klout score is 10 points lower than Justin Bieber. Kim Kardashian is at number 5 at 10,458,449 followers yet she is 1 point higher in Klout score than Lady Gaga the current number one. Justin Bieber has a perfect 100 Klout score and I think it won’t be long before he passes Gaga and becomes the first to obtain 20 million followers based on the influence he has in the Twitter world. One thing we do know is that Twitter is still very relevant in celebrity circles and their followers are still growing with each passing day. The rate at which one gets followers may have slowed down some but their influence on these followers has in fact grown stronger. Facebook may have the most users, and yes, Linkedin was the first to go public but Twitter is still the fastest most uncluttered way the world shares news via social media. What are your thoughts on how Twitter’s influences has shaped the social media and the traditional media universe?